Conn, right, and Sheri Macomber. When he retired in 2017 after 20 years of service at Western Michigan University – mainly as Director of Projects and Construction – Conn Macomber had directed a number of pivotal projects for the university, among them the building of the new Sangren Hall, the remaking of East Campus, including Heritage Hall, and, most notably, the renovation of the building in downtown Kalamazoo that became the medical school’s W.E. Upjohn M.D. Campus. 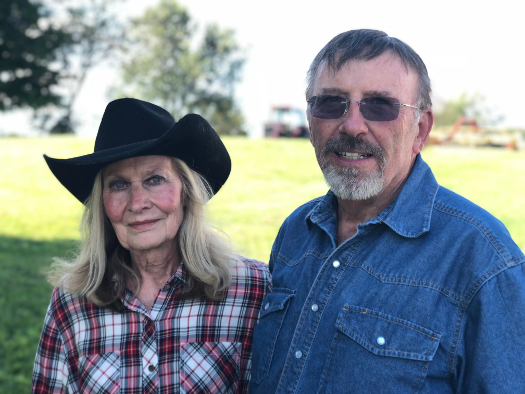 Since closing the book on a very special career at WMU, Conn and his wife, Sheri, have spent their days enjoying their farm and tending to their beloved horses. And, more than anything, the couple has sought out ways to give back to WMU and the community. Recently, that led the Macombers to make a generous bequest to the medical school that will establish the Macomber Family Endowed Scholarship Fund. The scholarships, once available, will benefit future WMed students who demonstrate a financial need and recipients will be chosen during any year of their enrollment at the medical school. “We wanted to do something that was going to benefit everybody,” Conn said. “For us, this is the place. I feel very passionate about the medical school. I love the school, I love the concept and I think Dr. (John M.) Dunn did a fabulous job getting it in place. I think it was his greatest gift to the university as far as I’m concerned. WMU is special to the Macombers and both are alumni of the university. Sheri earned her bachelor’s degree in education from WMU and Conn earned his bachelor’s degree in Physics, Chemistry and Math. Conn also earned his master’s degree in Experimental Psychology from WMU. Prior to the W.E. Upjohn M.D. Campus opening in 2014, Conn was part of the team that led the $68 million renovation of the building. Today, he recalls the scope of the project fondly and how he worked to have every detail covered right down to the decision to install the building’s terrazzo flooring. The Macombers said they value the mission of the medical school to train competent and compassionate physicians who will have a positive impact on healthcare in the U.S. The economic impact of the institution also can’t be overstated, Conn said. “It’s very exciting,” he said. “I think it’s one of the greatest things to ever happen to the city of Kalamazoo. I think two great things really happened recently and one of them was the Kalamazoo Promise and the other was the medical school. The Macombers said they are excited about the impact their bequest will have on the medical school and medical education in Kalamazoo. It is a legacy both say they are proud of. They said they are hopeful that their gift to the medical school will give life to the dreams of aspiring physicians at WMed. They also are hopeful that their generosity will become contagious and prompt alumni and others in the community to give back to the medical school and their alma mater, no matter the size of the gift.